While browsing the produce section at HiperCor (grocery section of El Corte Inglés department store), I overheard a customer inquire, “¿Donde están las zanahorias de Conil?” Where are the carrots from Conil. Since when do carrots have place names? Conil de la Frontera is a town in Cádiz province, on the Atlantic coast, better known for tuna and for its fabulous beaches. But, apparently, market gardens thrive there too and carrots are a star product. 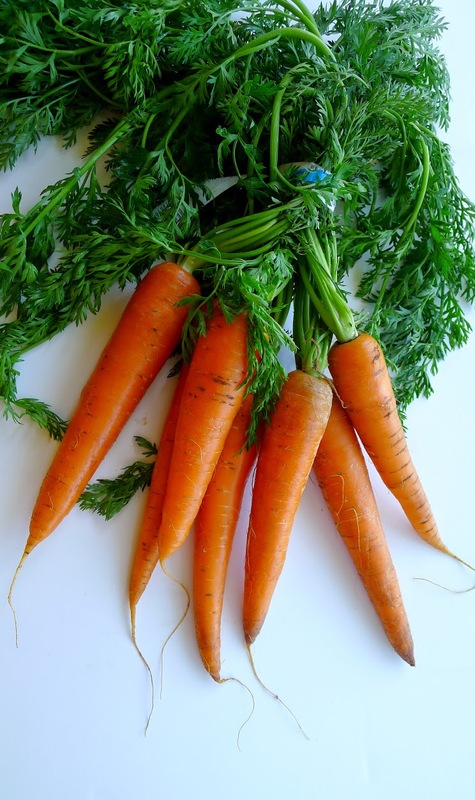 Carrots are no big deal in Spanish cooking. 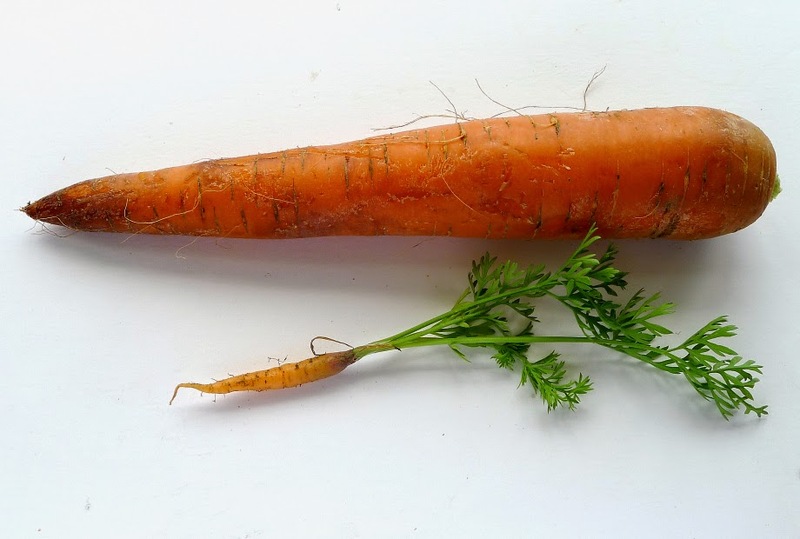 Sure, you need a fat, aromatic carrot in the puchero (soup pot), but nobody actually eats it. As a main ingredient or even a side dish? Not so much. This dish is an exception to the Spanish "carrots-bleh" attitude. 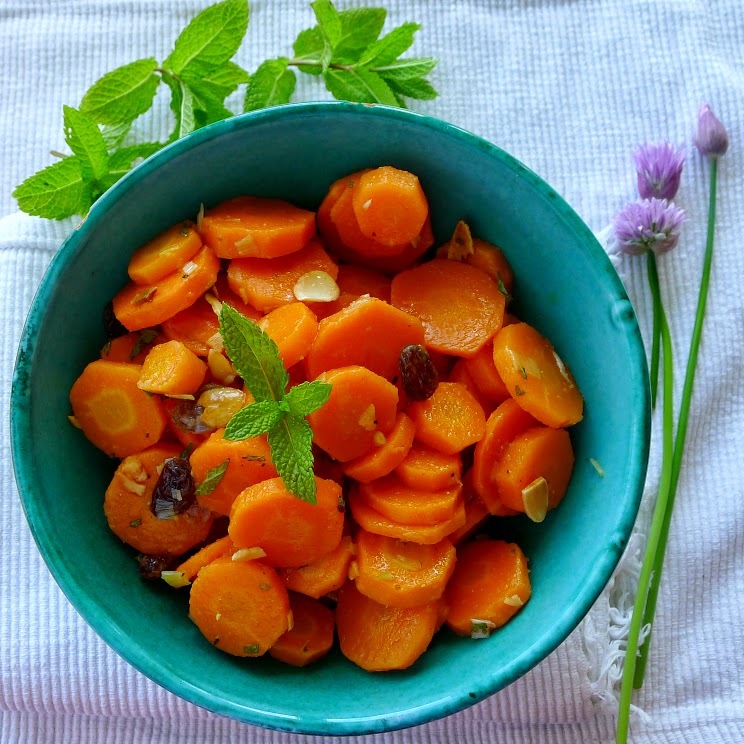 If you’re thinking that carrots are a cold-weather vegetable, let me show you their springtime incarnation: this salad of marinated carrots with a sprinkling of fresh mint. The color, the flavors, the aroma are so fresh and vibrant, perfect for the season. Baby carrot from my garden. Will they ever grow big? My mother had a carrot joke that she used to tell little kids. The kids never got the joke, but she loved to tell it anyway. I tried it out on my grandson (when he was only eight) and he howled with laughter. 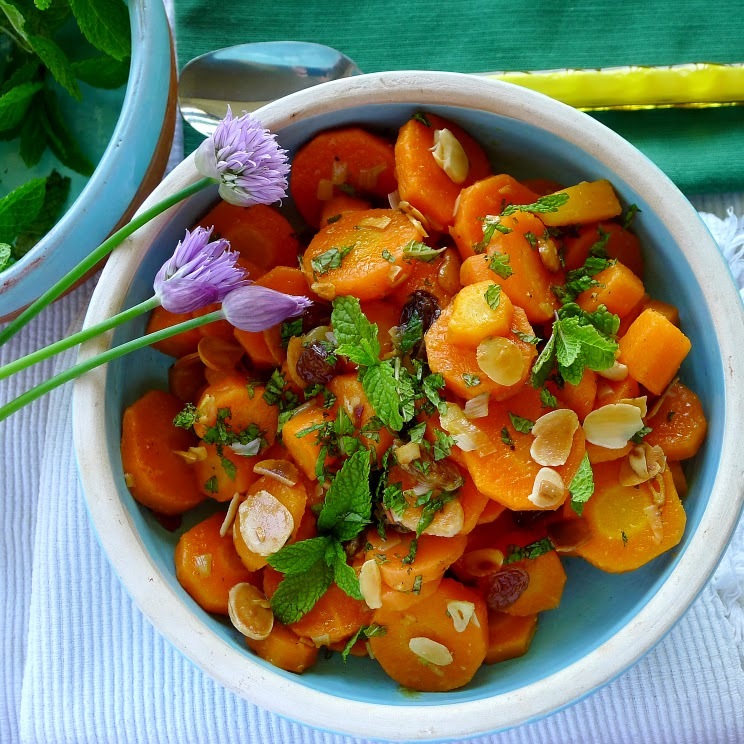 Marinated carrots with raisins, almonds and fresh mint. This carrot dish can be served hot, cold or room temperature. It can be prepared and served immediately or left to marinate, refrigerated, overnight. In any case, chop the fresh mint and add to the carrots immediately before serving. Serves 6 as a salad or side dish. In a small skillet heat the oil and fry the pine nuts or almonds until they are lightly toasted. Skim them out and reserve. Sauté the onion and garlic for 2 minutes. Stir in the cumin and raisins. Add the sautéed onions and raisins to the carrots with the pine nuts, vinegar, salt and pepper. Toss to combine. 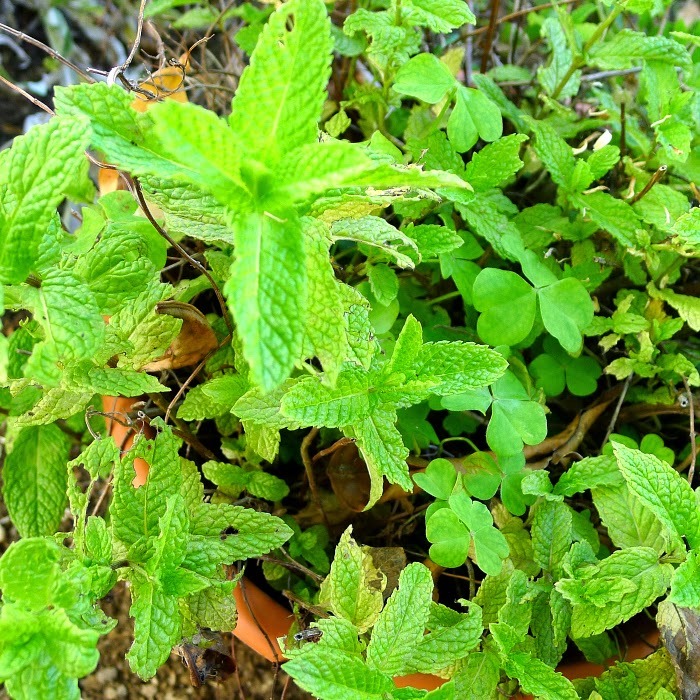 Stir in the chopped mint immediately before serving. Serve with salad greens, if desired. 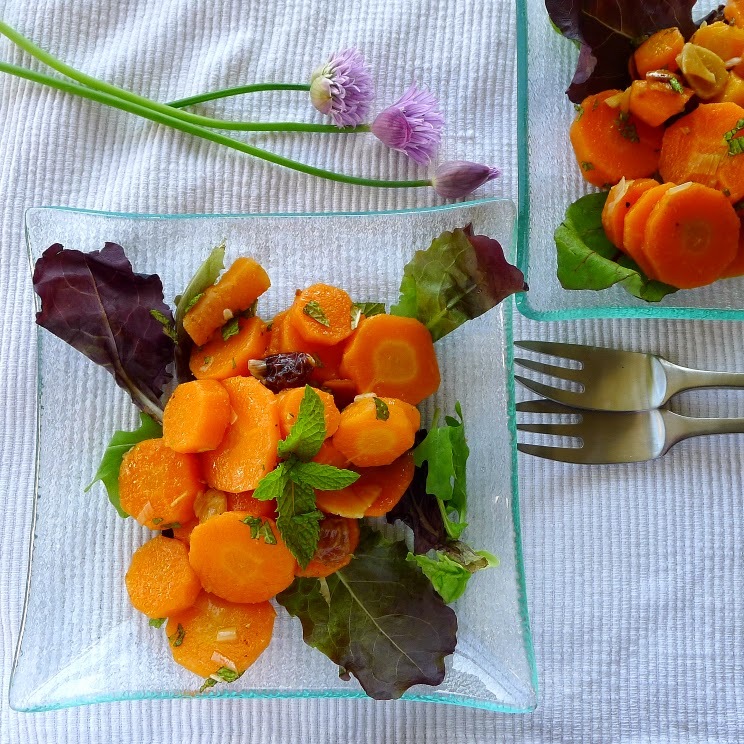 Carrot salad for spring. Those are chive flowers in the photo. We’re celebrating a birthday this week! At our house, birthdays almost always mean carrot cake. When the kids were growing up, I could depend on the carrot cake recipe, even with a cranky Spanish oven, and I knew the cake would feed a bunch of kids gathered for a party. 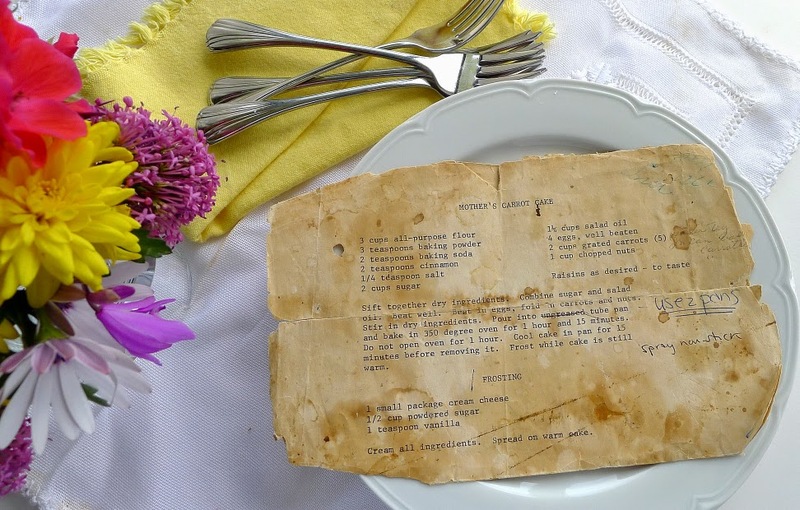 Original recipe, tattered and stained. 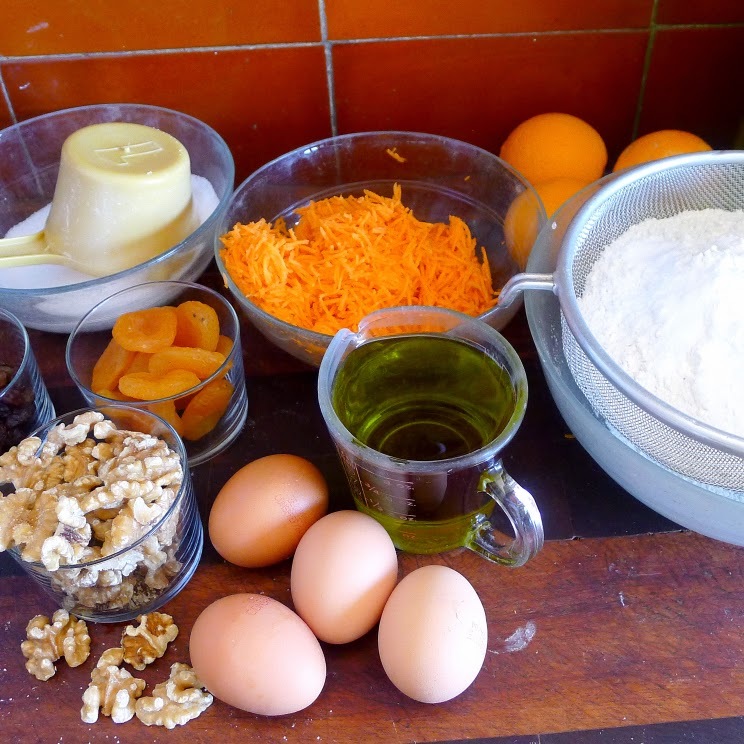 I found a recipe in a Spanish cookbook published by a local lady (Mas Ollas Que Días, by Josefa Ruiz Arnao) for Tarta “Hippy.” It is a basic carrot cake, with almonds, chopped figs and raisins, making a very Spanish rendition. The designation of "hippy cake" made me smile. 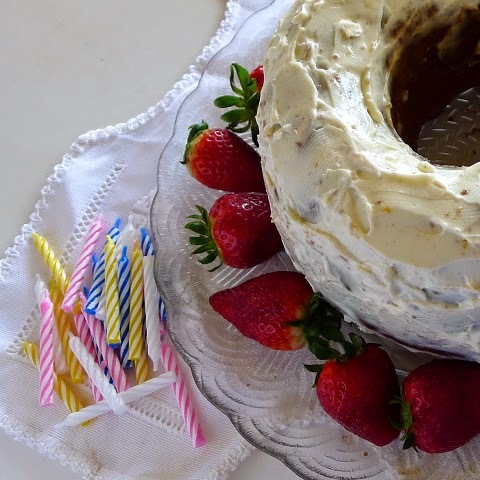 I made this birthday cake in the same old bundt pan I’ve always used. Its six-cup capacity is too small for the amount of batter the recipe makes, so I wind up making a little cake on the side. (In the recipe I suggest using an eight-cup pan.) 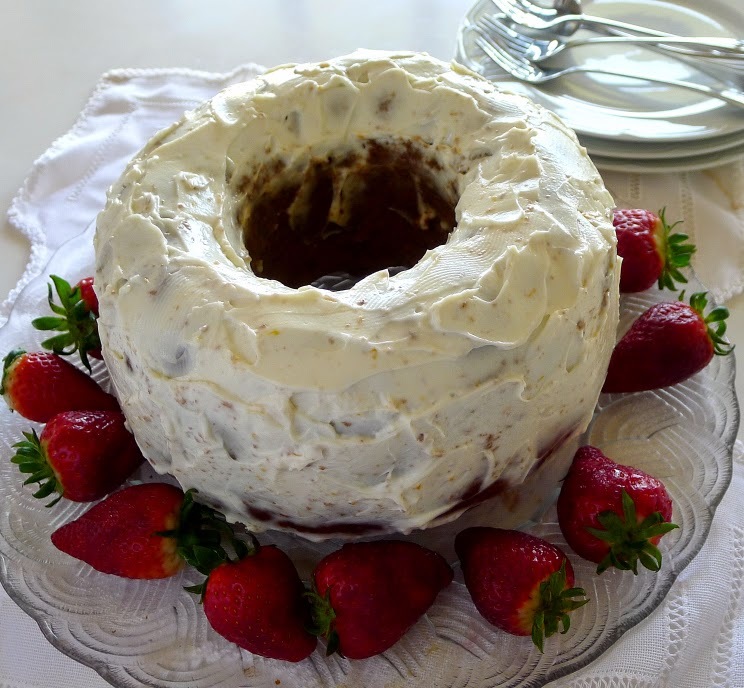 The ring mold is good, because it lets oven heat penetrate to the center of the cake. But, I think next time I’ll try baking the cake in three layer pans. I’ve also used the carrot cake recipe to make Olive Oil Carrot Muffins, reducing the sugar to ½ cup. They are so good served with (unsweetened) cream cheese or any soft cheese. 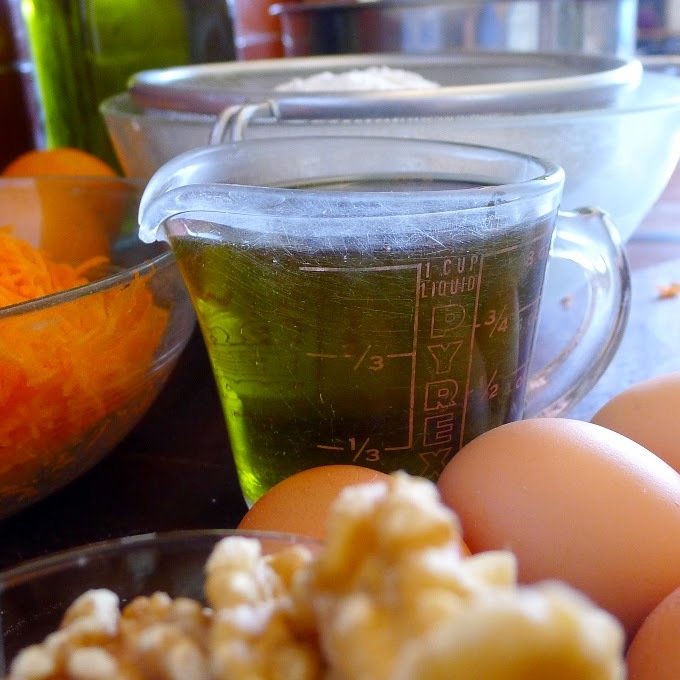 Olive oil is a principal ingredient in this carrot cake. Preheat oven to 350ºF. Lightly grease an 8-cup bundt pan or ring mold. Sift together the flour, baking powder, soda, cinnamon and salt. Combine sugar and oil in a large mixing bowl. Beat well. Beat in eggs one at a time until mixture is thick and creamy. Add cardamom, ginger and orange zest. Beat in the dry ingredients. Fold in the carrots, nuts, raisins and apricots. Pour the batter into the pan. Bake for 1 hour without opening the oven door. Test the cake with a skewer—it is done when the skewer comes out clean. Bake 15 minutes more, as necessary. 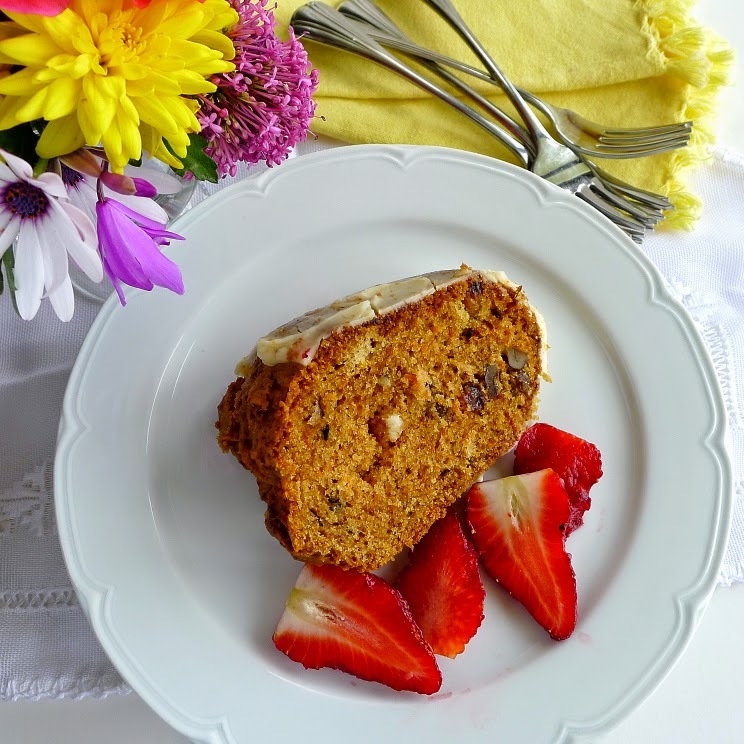 Olive oil carrot cake is moist and flavorful. Cream all ingredients. Spread on warm cake. What an apt name! 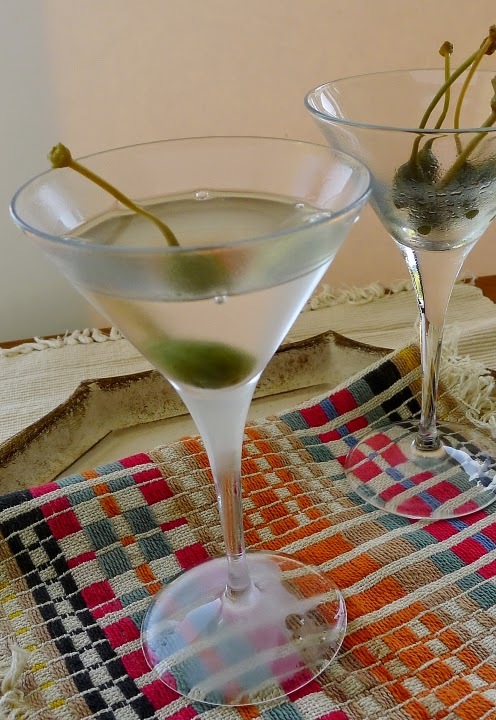 The caper, with its sprightly piquancy, adds playful punch to many savory dishes. It's name comes from the scientific nomenclature, capparis spinosa, a thorny bush that grows wild in Mediterranean regions (alcaparra in Spanish). I found it, improbably, sprouting from a white-washed wall in the village, below which political posters for an upcoming election were plastered. It is the flower bud of the caper bush, pickled or preserved in brine, that provides the culinary condiment we buy bottled on the grocer's shelf. 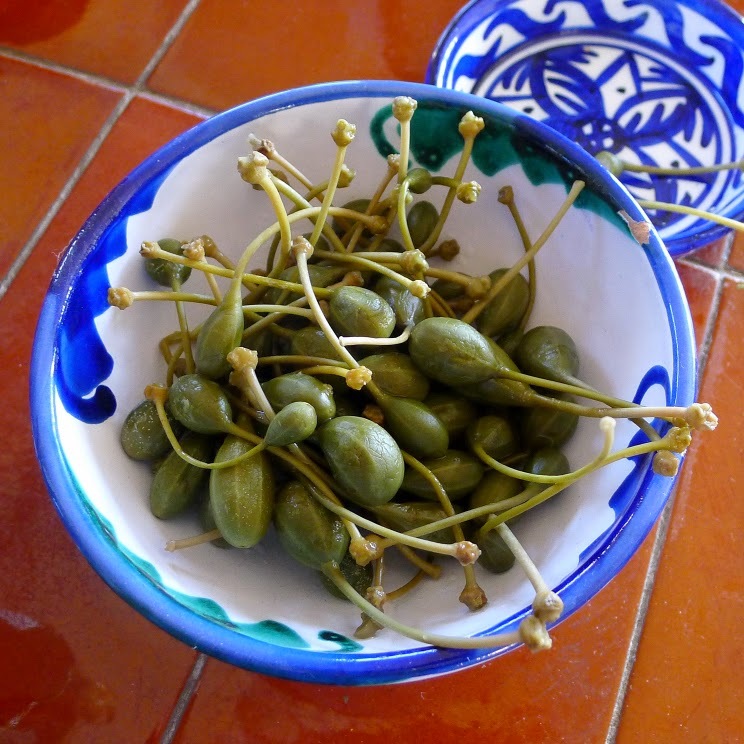 If allowed to bloom, the flowers produce a seed pod, culinarily known as “caperberries” (alcaparrones). These, too, are brined and used as a condiment. The berry has a bit of crunch, but can be used interchangeably with capers. 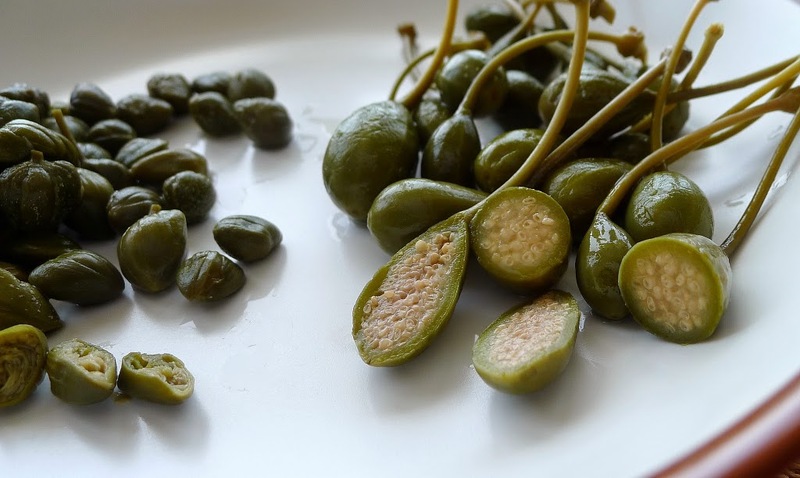 Spain continues as the world's market leader in capers, although nowadays they are sourced from growers in Morocco and Turkey. 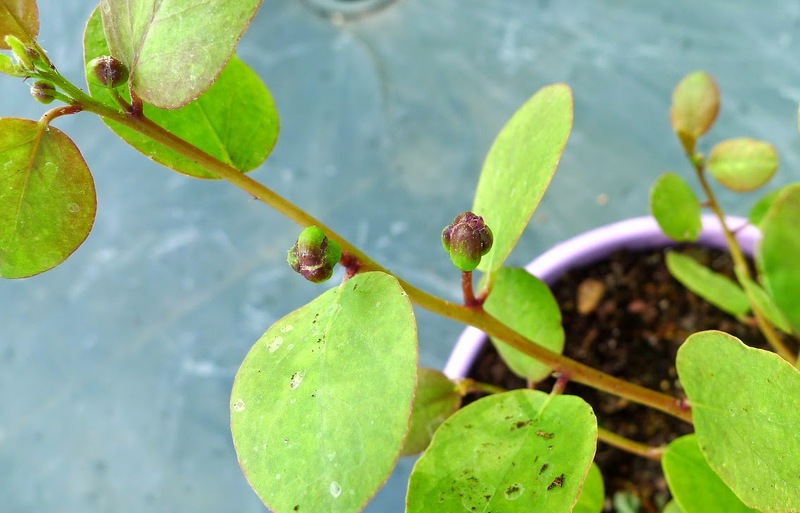 Caperberries have a slight crunch. 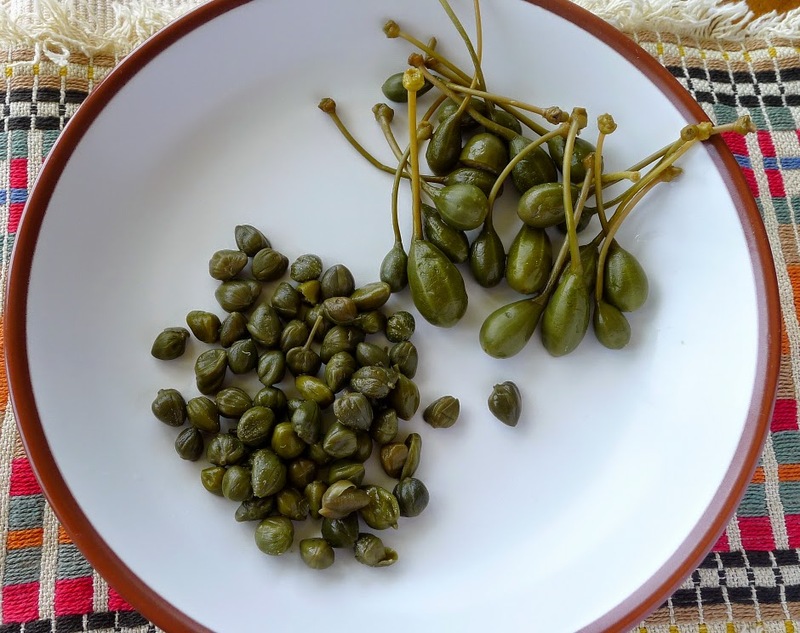 How to use capers? Throw them into just about any dish that needs some pizzazz. Their salty tang really perks up any food, but seems to have a special affinity for fish. Put capers on pizza, toss them with pasta. Use them in any way you might use olives, for instance, in cauliflower salad, stuffed eggs, potato salad. 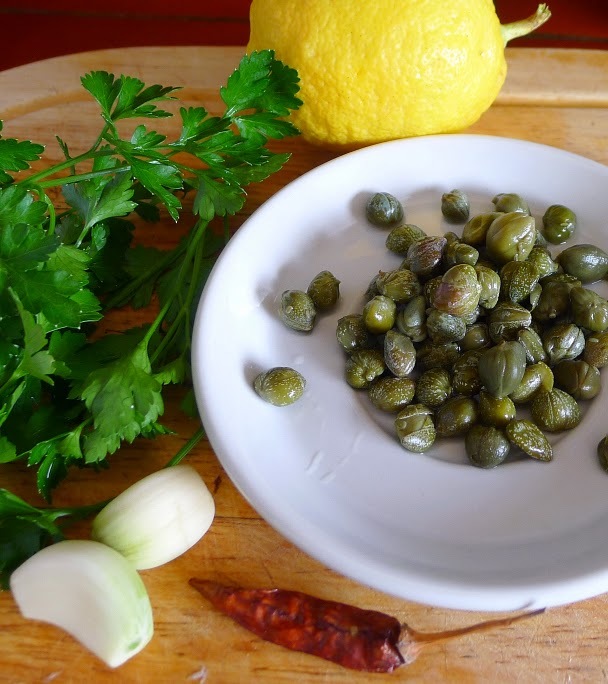 Add capers to classic sauces such as tapenade, vinaigrette, remoulade, ravigote, tartare. Serve them with smoked salmon or, stirred with sour cream, as a topping for baked potatoes. 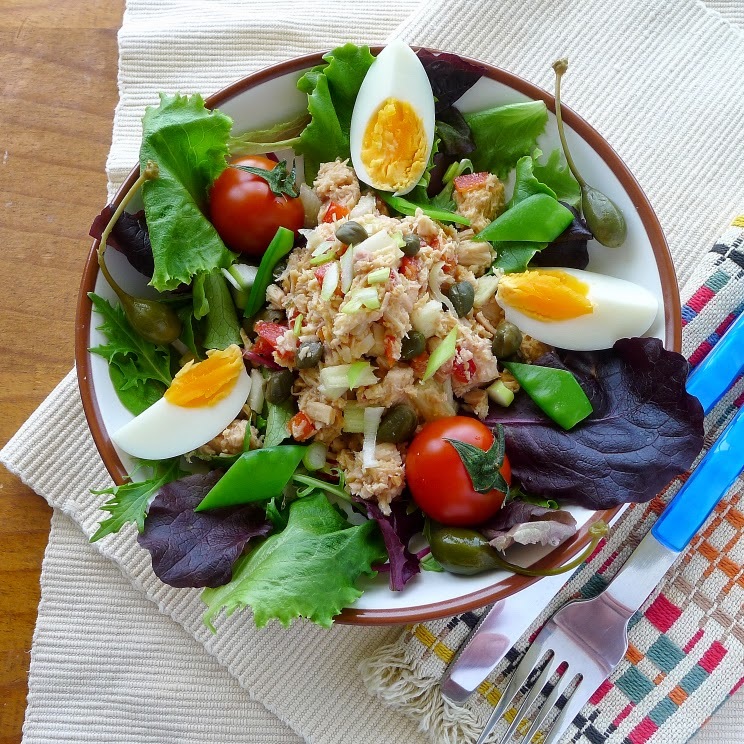 Tuna salad with capers and caperberries. Combine capers with tuna canned in olive oil, chopped celery, green onions and lemon juice for the best-ever tuna salad (no mayonnaise!). 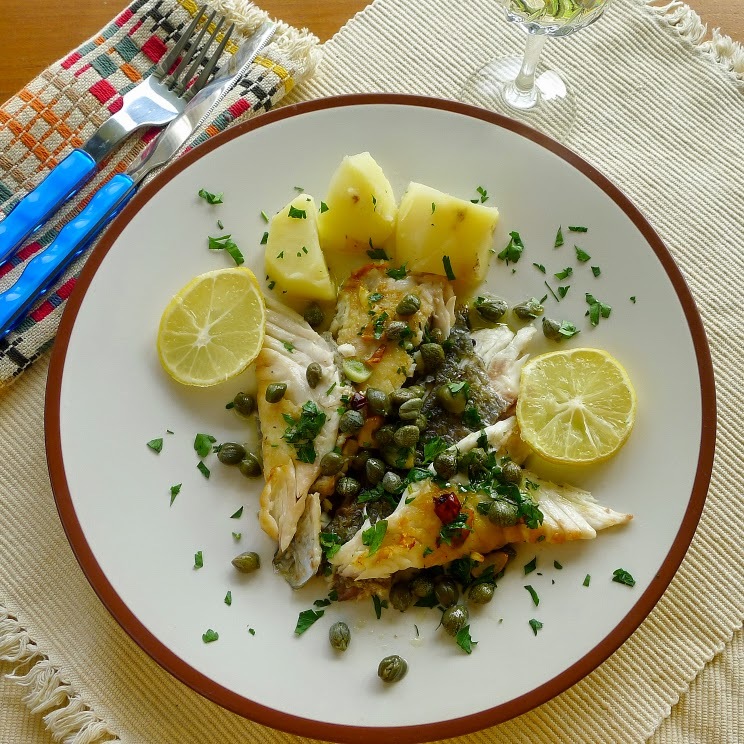 Caper sauce adds pizzazz to grilled fish. 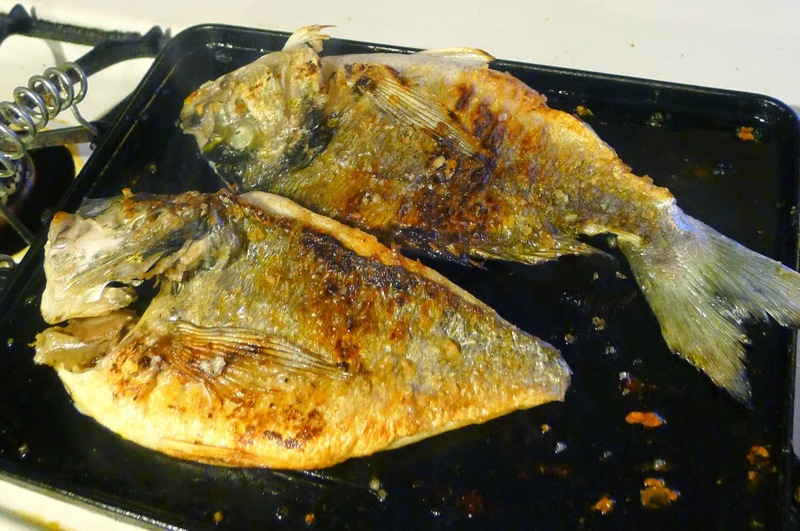 This fish is cooked a la espalda –“on its back”. Originally a style of grilling a la brasa, over hot coals, this is easy to do under a broiler or on a plancha, a flat iron grill pan. My favorite plancha is reversible--a ridged grill for meat on one side and a flat one for fish and shellfish on the other. Butterflied fish is grilled on a plancha. Have the fish gutted, scaled and split open along the belly and butterflied. Remove the spine. The head is usually left on, split open so that it lays flat. Open the fish out flat, salt it lightly and let it rest 30 minutes at room temperature. Grilled fish has crispy skin. After grilling, you can serve the whole fish with sauce spooned over and allow each person to lift off the bones, fins and head (and fish out the delicious dollop of flesh in the cheeks). Or, remove all the bones in the kitchen and serve the fillets on heated dinner plates with the caper sauce. 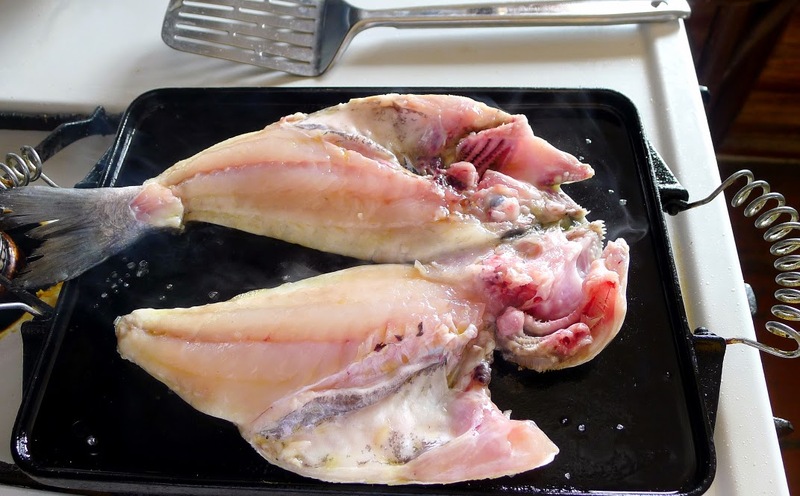 If cooking the fish under the broiler instead of on a grill pan, preheat the broiler pan and do not turn the fish. 2 whole sea bream, weighing about 1 ¼ pounds each. Brush a flat grill pan with oil, sprinkle with salt and heat it. Pat the fish dry with paper towels. Brush both skin and flesh sides with oil. Lay the fish, skin-side down, on the hot grill pan. Grill 5 minutes. Carefully turn the fish and grill flesh-side down 2 minutes longer. Transfer the grilled fish to a heated platter and serve it, on its back, with the caper sauce spooned over it, or fillet it and serve on heated dinner plates. This makes enough sauce for two 1-pound fish. Serve the sauce also with grilled chicken breast, veal or tuna steaks. Heat the oil in a small skillet. Sauté the garlic and red pepper flakes until garlic begins to turn golden. Add the salt and lemon juice. Remove from heat and stir in the capers and parsley. Pop a caperberry in your next martini. I just bought a caper bush at the nursery gardens. Will find a sunny spot in the garden. See the little buds on the stem? About ready to pick and pickle. 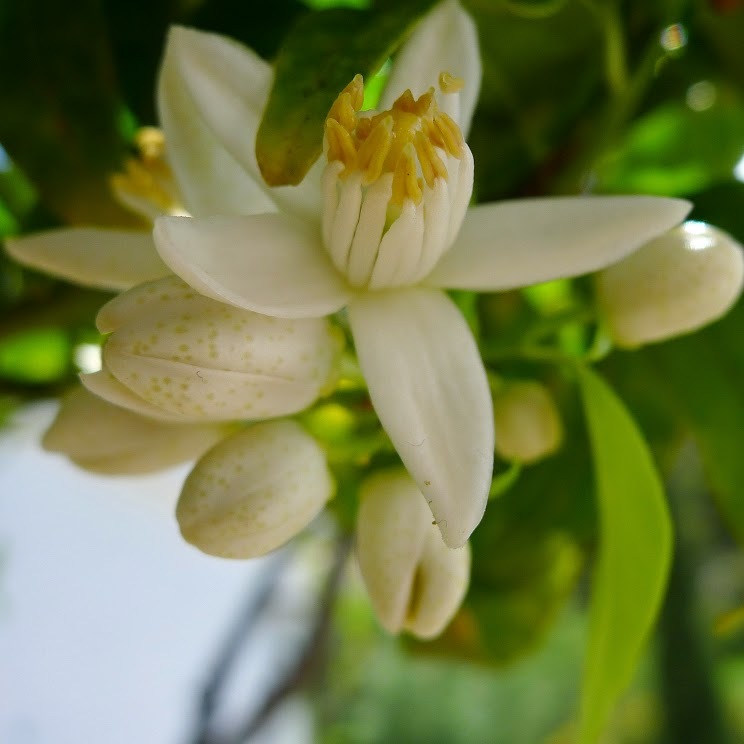 Intensely spring--the perfume of orange blossoms. From my kitchen window I look down across rolling hills and a river valley to the blue Mediterranean Sea. After spring rains the hills are covered with a velvety growth of new grasses. Wildflowers spring up in meadows. In the rocky crevices of the arroyo I hear partridge calling for their mates. The nightingales are tuning up their moonlight arpeggios and the swallows have returned to nest under the eaves. Bare, gnarled limbs of fig trees begin to sprout tender leaves, like green butterflies alighting on the tips of branches, some with nubbins of tiny new figs. Vineyards show new sprigs of green on pruned-back vines. A grove of orange trees borders my property. When they bloom in the spring the heady fragrance fills my valley. It is so achingly sweet. Fresones--extra large, extra sweet strawberries. The orange blossoms inspired a dessert for tomorrow’s dinner party. 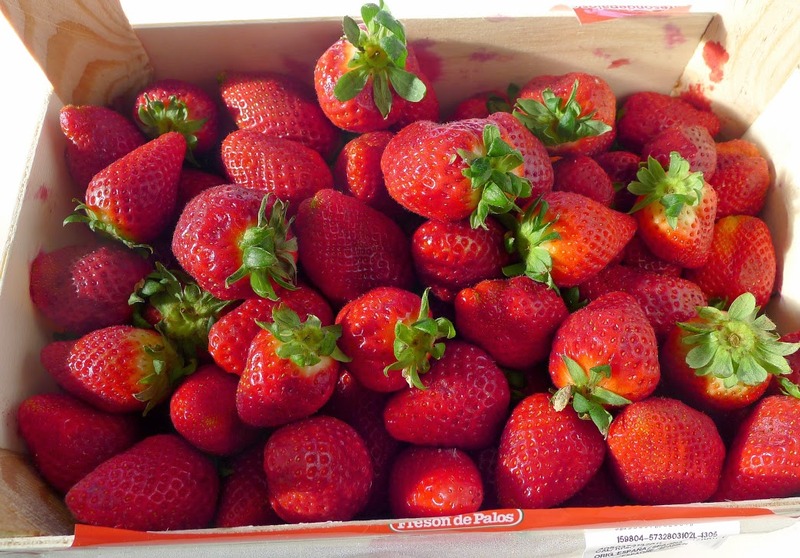 At the supermarket I bought a two-kilo box of strawberries (about $5.00 for 4 ½ pounds). They are huge fresones, grown in Huelva province (southern Spain). You might think that berries this glamorous can’t possibly have any taste, but they are sweet and flavorful. To go with the strawberries, I concocted an orange-blossom sauce, adapted from a recipe for Mulhalabya in Paula Wolfert’s Moroccan Cuisine. 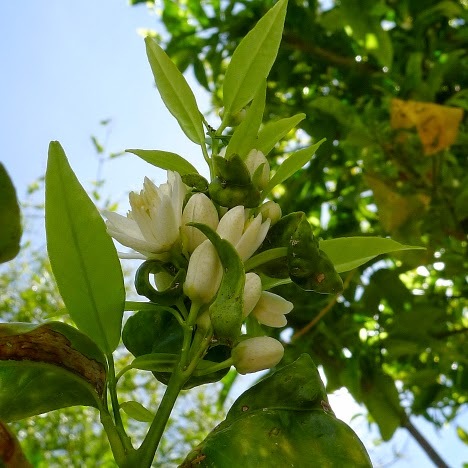 Her recipe calls for orange blossom water. I used real orange blossoms instead, steeping them in hot milk. The orange blossom infusion is wonderfully fragrant, but slightly bitter. I added powdered stevia to sweeten. Cornstarch and an egg yolk thicken the mixture to make a pouring custard. Bring 2 cups milk to a boil. Remove from heat and add a strip of orange zest, 3 crushed cardamom pods and ¼ cup washed orange blossoms. Allow to infuse for 30 minutes. Strain the milk, discarding the blossoms and zest. In a small bowl, mix 4 tablespoons cornstarch with ¼ cup milk. Place the orange-blossom milk in a saucepan with sugar or stevia to taste (2-4 tablespoons) and whisk in the cornstarch. Cook, stirring constantly, until thickened. Beat 1 egg yolk in a small bowl. Stir some of the hot milk into the yolk, then whisk it into the saucepan. Cook until thickened. Cool, then refrigerate until serving time. To serve, spoon the sauce over berries. 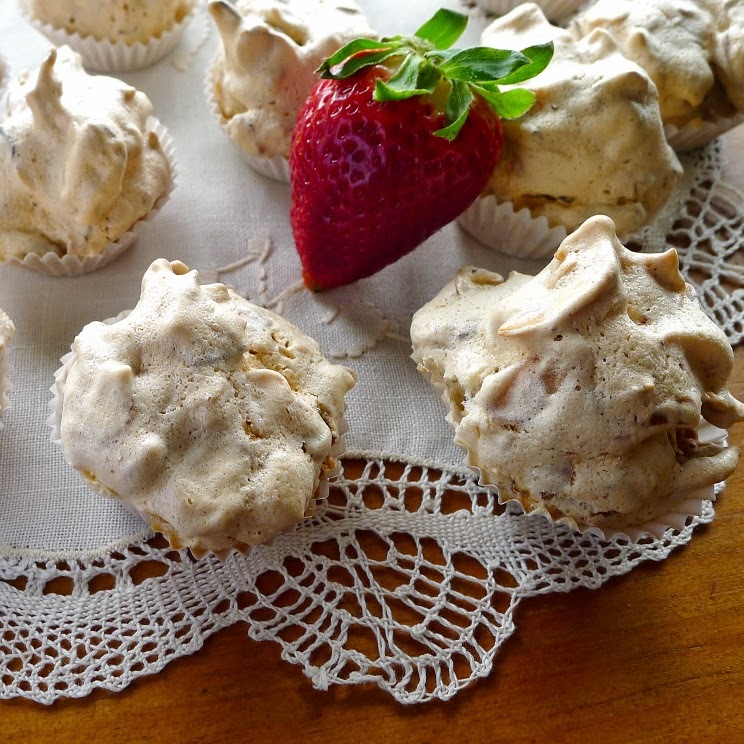 Alongside the strawberries with orange blossom sauce, I’ll serve crunchy almond meringue cookies, made with the leftover egg whites from a yolk extravaganza a couple weeks ago (see the recipe for Crema Catalana here). I saved the whites in the freezer. 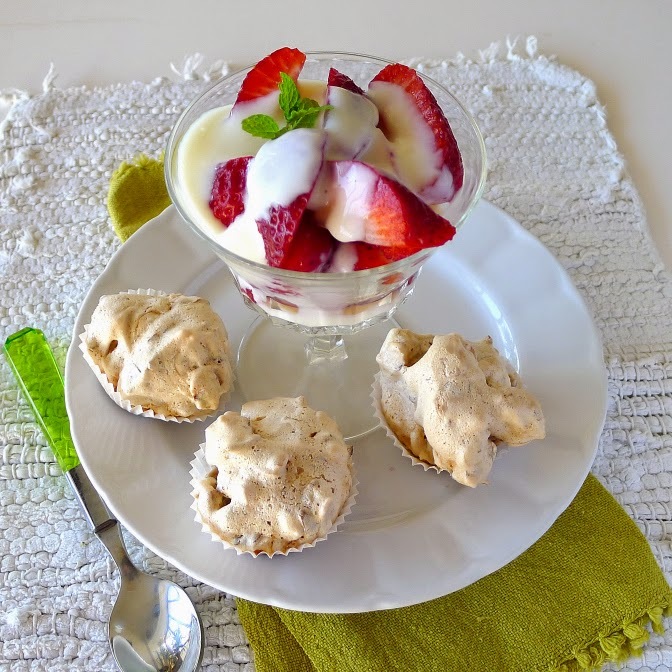 Crunchy almond meringue cookies with berries, orange blossom sauce. The puffs can be made with finely chopped almonds, but sliced or slivered almonds make a wonderfully crunchy cookie. Makes about 30 2-inch puffs. Preheat oven to 350ºF. 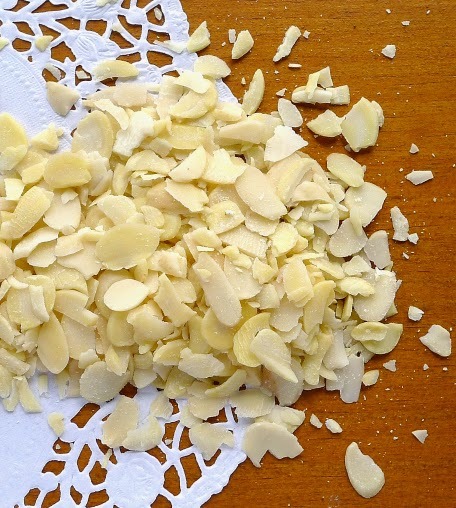 Spread sliced almonds in a shallow oven pan and toast them in the oven, stirring once or twice, until they are very lightly toasted, about 5 minutes. Remove and let them cool. Reduce oven heat to 250ºF. Place the egg whites in a mixing bowl. With a mixer on high speed, beat them until stiff. Beat in the sugar, lemon juice and zest. Fold the almonds into the egg whites. Line baking sheets with no-stick baking paper or, alternatively, have ready about 30 small (2 inch) fluted paper cups on a baking sheet. Spoon the almond batter onto baking sheets or into the paper cups, mounding it. Bake 40 minutes in a slow oven. Turn off the oven and let the puffs cool in the oven. Store them in an air-tight container.